The MIA Mover project was a lesson in tree/palm removal, relocation, and mitigation. In order for construction of the people mover (which connects the newly built car rental center to MIA) a large swath of land needed to be cleared so that construction equipment could build the supports and hoist the MIA Mover track in place. 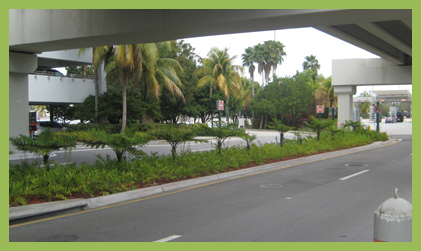 Once that work of installing the people mover was completed our landscape plans called for plan installation to be completed in a manner that made it look like no plant materials were touched during the construction. In essence we blended the existing landscapes into our design landscape for a cohesive landscape once the project was completed. The Port of Miami Tunnel project is a unique project in terms of Miami and Florida in general. Outside of tunnels at Walt Disney World there is only one other tunnel project in the state of Florida. It’s the Henry E. Kinney Tunnel in Fort Lauderdale. The Port of Miami Tunnel will connect Watson and Dodge islands via an eastbound tunnel and a westbound tunnel that travel underneath Biscayne Bay. Our challenge as landscape architects was to design the entrances and exits of each tunnel in a manner that tied the urban experience (vehicular travel) to a human scale (an aesthetically pleasing landscape). We’ve met this challenge by imitating nature and calling for native plants to be installed as “natural” hammock landscapes.